World Intellectual Property Day is observed every year on 26th April to learn about the role that intellectual property rights play in encouraging innovation and creativity. “World Intellectual Property Day” or “World IP Day” was established by the World Intellectual Property Organization (WIPO) in 2000. This day is observed annually to raise awareness about how the Intellectual Property patents, copyright, trademarks and designs impact on daily life. It is celebrated to mark the creativity and contribution made by creators and innovators to the development of societies across the globe. 26 April coincides with the date on which the Convention establishing the World Intellectual Property Organization (WIPO) entered into force in 1970. Therefore this day was chosen as the World Intellectual Property Day. 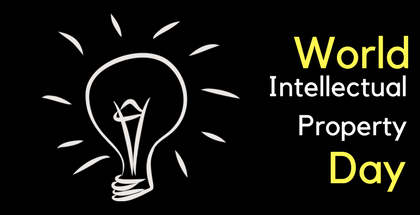 The World Intellectual Property Organization (WIPO) works together with various government agencies, NGOs, community groups and individuals to hold different events and activities to promote World Intellectual Property Day each year. This year’s campaign celebrates the brilliance, ingenuity, curiosity and courage of the women who are driving change in our world and shaping our common future. Breaking the barriers to women's creativity and helping to nurture their innovative ideas is the first step towards powering change in the field of innovation and creativity. Women need opportunities to innovate. In the past two decades several women scientists have come up with life changing innovations. A 2017 report on Gender Equality found that the number of women in the science, technology and innovation fields was low in the world's leading economies. World Intellectual Property Day focuses on increasing people's awareness and understanding of all aspects of intellectual property.